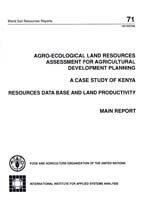 Any part of the national land resources data base and the productivity models described in this report may be modified in the light of new knowledge and/or new objectives. The data base and the models are part of a larger district and national level planning tool and they are expected to be expanded and refined with use. The designations employed and the presentation of the material in this document do not imply the expression of any opinion whatsoever on the part of FAO or 1IASA concerning the legal or constitutional status of any sea area or concerning the delineation of frontiers. All rights reserved. No part of this publication may be reproduced, stored in a retrieval system, or transmitted in any form or by any means, electronic, mechanical, photocopying or otherwise, without the prior permission of the copyright owner. Applications for such permission, with a statement of the purpose and extent of the reproduction, should be addressed to the Director, Publications Division, Food and Agriculture Organization of the United Nations. Viale delle Terme dl Caracalla, 00100 Rome. Italy.